The diary has been just updated with a seasonal message from Aisleyne and a recently taken seasonal photo. I understand that Aisleyne is likely to be around over Christmas and it's very possible she'll respond to any posts. and HAPPY BIRTHDAY AISLEYNE for the 28th December! 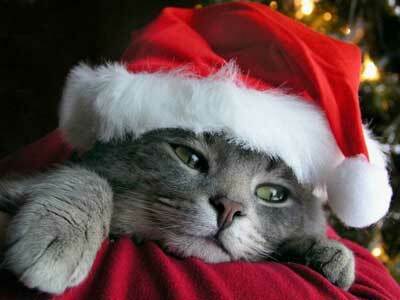 Happy Christmas, Happy Birthday, Happy New Year - oh, do you know what? Just have a Happy Everyday!!! Happy Christmas holiday to Aisleyne and everyone on OA. Location: Gosport A VERY HAPPY BIRTHDAY, AISLEYNE!! Have a great day. Thank you all so much for all your christmas and birthday wishes. Honestly means more than you may realise! Here's to a happy healthy and prosperous new year. Aisleyne is spending the day with a girlfriend being pampered at a Spa in London, followed by a quiet meal tonight. She will be further celebrating tomorrow night at a club in the West End. Have a great time, Aisleyne! Late birthday card made for you (of a distinctly geeky type). You share the same birthday as another close friend of mine and I made her one as well. Nice message Aisleyne. I hope you enjoyed your birthday. 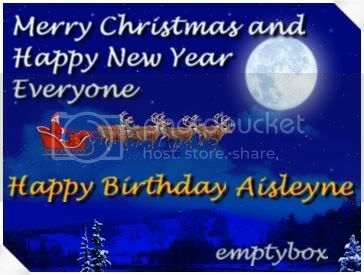 And a HAPPY NEW YEAR to Aisleyne and all forum members from me! Location: Scottish Borders All the Best for 2010. Happy New Year to Aisleyne and all members. Big thanks to OA, Ofni, Secrethousemate, Emptybox, Premierscfc and anybody else connected to the running of Officially Aisleyne. Your hard work is much appreciated.